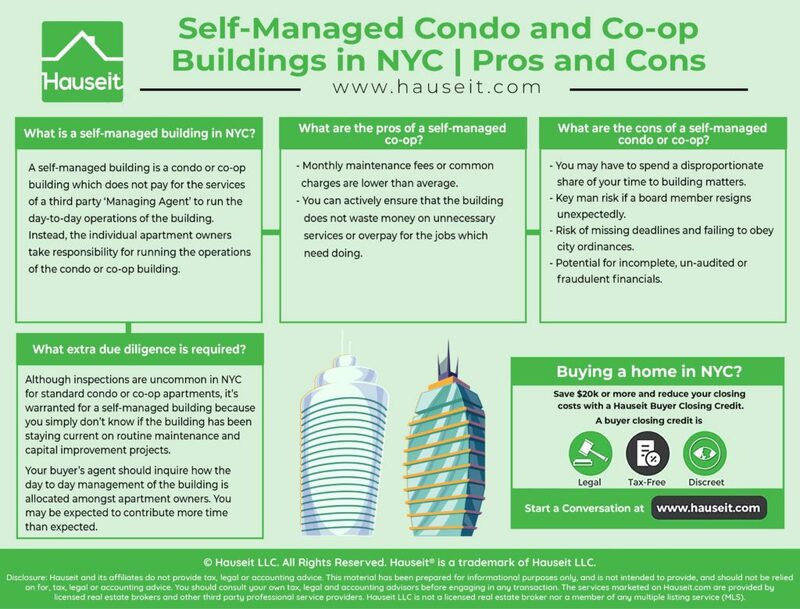 What does it mean if a co-op or condo building in NYC is self-managed? What are the pros and cons of buying into a self-managed building in NYC? Are there any extra precautionary steps you should take if you are buying an apartment in a self-managed building? What is a self-managed building in NYC? What are the pros of a self-managed co-op in NYC? 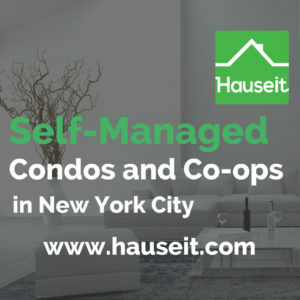 What are the cons of a self-managed condo or co-op in NYC? What extra due diligence is required when buying into a self-managed building? A self-managed building is a condo or co-op building which does not pay for the services of a third party ‘Managing Agent’ to run the day-to-day operations of the building. Self-managed buildings in NYC are typically very small and have less than 15 units. If a building is self-managed, it means that the individual apartment owners take responsibility for running the operations of the condo or co-op building. Such responsibilities include: collecting monthly maintenance / common charges fees, bookkeeping, routine maintenance, paying bills and handling capital projects. Apartments in a self-managed building usually have lower than average monthly maintenance (or in the case of condos, unusually low common charges). This is because the building saves $1,000-$2,000/month by not having to pay a managing agent. Pro Tip: While condo apartment owners pay two separate monthly bills (common charges and real estate taxes), co-op apartment owners make one combined monthly payment called the ‘monthly maintenance payment.’ A portion of the co-op monthly maintenance payment is tax deductible. To learn more about condos vs. co-ops, read our comprehensive comparison here. The key benefit of living in a self-managed co-op or condo is that the monthly maintenance (or common charges) is lower than average. These savings are a result of the building not hiring and paying a Managing Agent. If the Managing Agent charges $1,500/month and there are only 10 apartments, being self-managed would save each apartment owner around $150/month. You might be asking, isn’t it worth paying an extra $150/month so that I don’t have to spend all day managing my apartment building? Surprisingly, the decision for a building to become ‘self-managed’ isn’t always a financial decision. The challenge with smaller buildings in NYC is that they simply cannot afford to hire one of the more professional and established managing agents. Many small buildings end up hiring a managing agent only to find that the apartment owners still have to do most of the work themselves! Why overpay someone for low quality work? Large apartment buildings in NYC have hundreds of apartments and can therefore afford to hire the most professional and experienced managing agents. For example, the Seward Park Cooperative in the Lower East Side (which has over 1,700 apartments) has a dedicated team of full-time employees who work for the managing agent Charles H. Greenthal & Co.
Another pro of living in a self-managed condo or co-op is that you can actively ensure that the building does not waste money on unnecessary services or overpay for the jobs which need doing. For example, if your building needs sidewalk repair you could help the building interview contractors and compare quotes. If the building had a managing agent, you’d likely have much less say over which contractor would be hired and how much money the building is going to pay for the service. Pro Tip: Estimate your buyer closing costs in NYC with our interactive closing cost calculator. The main downside of buying into a self-managed building in NYC is the risk that you’ll end up having to dedicate a disproportionate share of your time to building matters. While being involved in running your building can be very rewarding, you may grow tired of having to pick up the slack of your neighbors. Another risk of self-managed apartments is key-man risk. What if the board president or treasurer of 10 years abruptly resigns? Does the building have anyone else with the level of knowledge required who is ready, willing and able to step in and fill the void? In addition, is your building capable of navigating through the city’s complex list of ordinances, filing deadlines and other legal and tax requirements? Missing deadlines and failing to obey city ordinances can end up costing you and your building major money. An additional risk of buying into a self-managed building is the potential for incomplete, un-audited or fraudulent financials. Just because a building is self-managed doesn’t mean that you should assume their finances are shady, but it’s a good idea to have your real estate attorney review the finances and the building’s budget. As part of the board interview and co-op board application process, a self-managed co-op may be actively looking for someone who expresses a desire to contribute to the day-to-day management of the building. Pro Tip: Most self-managed buildings won’t have ‘audited’ financials since the building is not paying for professional management services. All this means is that your attorney should review whatever financials are available. It is not advisable to blindly assume that ‘unaudited’ financials are sketchy, because this is not always the case. 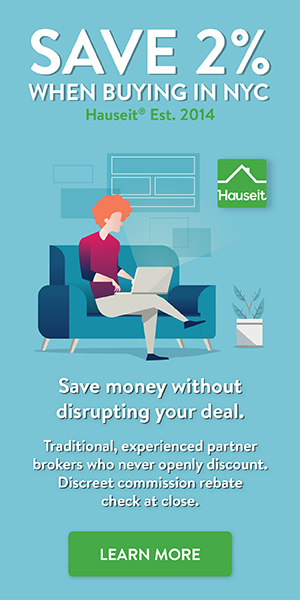 Remember that you are directly benefiting from the building’s lower cost structure by having lower maintenance (or common charges) for the apartment you are buying! Requesting an inspection prior to contract signing is a great idea if you are buying into a self-managed building. Although inspections are uncommon in NYC for standard condo or co-op apartments, it’s warranted for a self-managed building because you simply don’t know if the building has been staying current on routine maintenance and capital improvement projects. As part of the standard contract due diligence process, your real estate attorney will also review the building’s financials, budget, offering plan and board meeting minutes (if available). As we mentioned previously, not all self-managed buildings will have audited and organized financials that look like the financial statements of a publicly traded company that is paying millions of dollars to an accounting firm! Your buyer’s agent should also be sure to inquire as to how the day to day management of the building is allocated amongst apartment owners. In some instances, the building may be actively looking for a new apartment owner who is interested in becoming the treasurer or board president right away. For a self-managed co-op building, it’s important to understand that you will be expected to contribute to the community by helping the building with it’s affairs. What Is a Co-op Special Assessment in NYC?